Ketchup can be found in 97% of American kitchens. Think about that for a moment, 97%! Some people can’t imagine eating a French fry, hot dog, or hamburger without it. The only condiment/sauce used more here on campus is most likely ranch dressing (I was told once that each cafeteria goes through several gallons a day). As beloved as ketchup is in America, it’s origin lies elsewhere. It originally was not the thick, sweet, tomato based condiment we think of today. The original precursors to what we know as ketchup was a fermented fish sauce popular across South East Asian, known as “keo-cheup”. The earliest known western recipes for ketchup were published in the UK in the 18th century (possibly the 1758 cookbook The Complete Housewife), and were made from kidney beans, mushrooms, anchovies, and walnuts. Early colonists in North America adapted these recipes to later include tomatoes, and the first known recipe for tomato ketchup made its debut in 1812. The popularity of tomato ketchup really took off following the Civil War. In fact, an 1891 issue of Merchant’s Review boasts that ketchup was the “sauce of sauces”, and in 1896 the New York Tribune declared tomato ketchup as America’s national condiment.Today ketchup is nearly synonymous with the Heinz Company, but they haven’t always cornered the market. 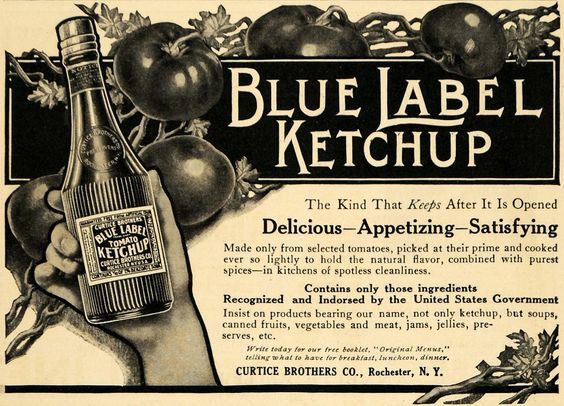 At the beginning of the 20th century one of their biggest competitors was Curtice Brothers Preservers Blue Label Ketchup. After cataloging two units from the Gunson/Admin assemblage we have identified at least eight Curtice Brothers Ketchup bottles. Having large amounts of condiment bottles in a historic assemblage is not surprising, but we have been surprised to find so many of the same brand. Brothers Simeon and Edgar Curtice founded Curtice Brothers Co. Preservers Rochester, New York in 1868. The canning business was created to save surplus vegetables and fruits that they could not sell in their small grocery store. By the early 1900s they were one of the largest ketchup and preserves producing firms, and continued production into the late 1960s. The specific bottles we have been recovering from the Gunson assemblage date from the early 1890s to the mid 1920s. The Curtice Brothers blue label line helped distinguish their bottle from other competitors. In the early 1900s they were equally as popular as Heinz. So what happened? Why did their brand fall out of popularity? That answer lies in the benzoate food wars. The pure food and drug act of 1906 was the first series of significant consumer protection laws enacted by Congress that also led to the creation of the Food and Drug Administration (FDA). The act served to ban foreign and interstate distribution of adulterated and mislabeled food and drug products. It required active ingredients to be placed on the product label. During this time benzoate was a preservative widely used in condiments, and the pure food law outlawed its use in food products due to health concerns. On one side of the ketchup establishment were those such as the Curtice Brothers that believed that it was impossible to make ketchup without the additive, and that it was not harmful in the small amounts used in their products. On the other side were manufacturers, like Heinz, that believed they could solve the preservative issues with modern science. They began to make ketchup with ripe tomatoes, increasing the amount of vinegar, and charging more, but offering a money back guarantee. Multiple lawsuits were filed by the Curtice Brothers Company fighting the ban, but their protests ultimately failed. The benzoate ketchups slowly disappeared from the market. By 1915 the Curtice Brothers Blue Label Ketchup had fallen out of favor, due to their insistence at using benzoates. The Curtice Brothers Ketchup thus far dominates our known condiments from the Gunson house. We have only one other ketchup bottle, Sniders Homemade Catsup from Cincinnati. Did the Gunsons love their ketchup? Perhaps. But the large number of bottles in this trash pit, specifically repeats of the same bottle type (such as the M.A.C. Dairy bottles) makes me suspect that Professor Gunson may have been saving and reusing the bottles, potentially in his experimental greenhouse. There also has not been a single paper label, complete or fragment, on any of these bottles. We will most likely never known for sure why there are so many ketchup bottles, but it’s always fun to investigate a small slice of the past. Smith, Andrew. 1996 “Pure Ketchup: A History of America’s National Condiment, with Recipes”. What do you think its worth I found one today? Hi James, we don’t assign value to any found objects. Hi Eddie, We don’t access any monetary values for artifacts. Bottle collecting websites would be my only suggestion. Yesterday, I was poking around an old Nevada smelter site (Belleville, abandoned 1895) and found a few interesting bottle fragments under a large sagebrush bush. As I walked away I noticed a screw-on bottle cap intertwined with the foliage…must have been pushed out of the ground as the plant grew. I got back to the studio this evening, pulled out a jewelers loupe and deciphered the letters imprinted in the cap as, “Curtice Brothers Rochester NY”. I just found a Curtice Brothers bottle still sealed and completely in tack buried in the surf on the coast of SC. The Manufacturer – Curtice Brothers Co. Paid $8.00 for it…Wondering if I overpaid or ? Hi Bill, As archaeologists we don’t provide any values for objects. i found a few blue label ketchup bottles today on a job site were we digging today intact . Wow, what an awesome find! Thnx for the post mate!!!!! For Christmas I asked my brother in law and sister in law for some old bottles. Just found an in tact Curtice ketchup bottle in Lowell MA during an excavation for a new building.